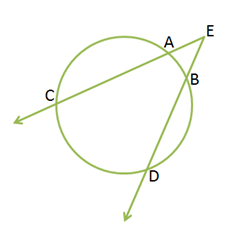 A secant is a line that intersects a circle at two points. In the figure below, is formed by two secants. The angle intercepts two arcs and . In this post, we will prove that the measure of the angle formed by two secants intersecting outside a circle is half the difference of the arcs intercepted by it. To prove this theorem we will connect and use the Inscribed Angle Theorem and Exterior Angle Theorem. Draw and let the measures of arcs and be and respectively. 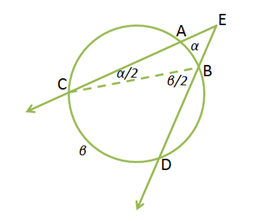 By the Inscribed Angle Theorem, the measure of the an angle inscribed in a circle is half the measure of its intercepted arc. Therefore, and . Substituting, we have t .
which is what we want to show.